International bestselling author Wendy Terrien received her first library card at age two, and a few years later started writing her own stories. She is Rocky Mountain Fiction Writers' 2017 Independent Writer of the Year. Her debut novel, The Rampart Guards (February 2016), earned a Kirkus starred review and was named to Kirkus Reviews’ Best Books of 2016. Wendy graduated from the University of Utah (go Utes!) and transplanted to Colorado where she completed her MBA at the University of Denver. She focused her marketing expertise on the financial and technology industries until a career coach stepped in and reminded Wendy of her passion for writing. Wendy began attending writers’ conferences, workshops, and retreats, and she hasn’t stopped yet. 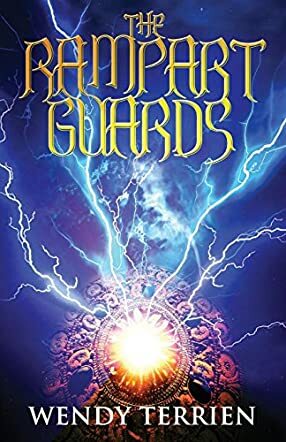 The Rampart Guards by Wendy Terrien is Chronicle One in the Adventures of Jason Lex. After Jason Lex's mom disappears one night, his dad decides to move him and his siblings closer to their grandma and the uncle their mom never wanted them to meet. When he starts seeing flying creatures, he turns to his uncle for answers and discovers a family secret. The flying creatures are called skyfish, and exist unseen with several other cryptids, including the Mongolian Death Worm. Not sure who he can trust, Jason has to fight against a surprising enemy in order to save his family and find his destiny. Wendy Terrien brings to life a world where cryptids are real, and connects to well-known history with fun twists. The skyfish are fascinating creatures that are said to be playful and are unable to be seen by the human eye, yet Jason's destiny begins when he sees them. This is just the beginning of his journey as he overcomes tragedy and danger. The end is just the beginning as it's clear that there's more to come for Jason to fulfill his destiny. Jason's life is flipped upside down when his mom mysteriously vanishes, and he's uprooted to a new town. Sadie gives him a friend, a confidant, and connects him to this new place where she knows everyone. Secrets are everywhere as Jason discovers why his mom didn't want his uncle around, why she left that night, and the startling secret that his brother has been keeping. The Rampart Guards is a brilliant story of a young hero's journey, with family secrets, betrayal, tragedy, and friendship. Aimed at young adults, but perfect for anyone who loves adventure and cryptozoology!